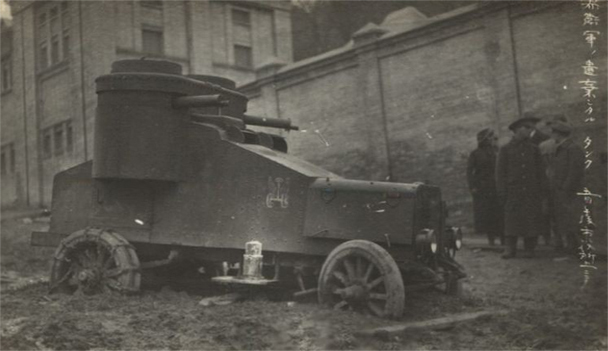 Very little is known about this Armstrong-Withworth armored car. It was never accepted in service by the British Army. 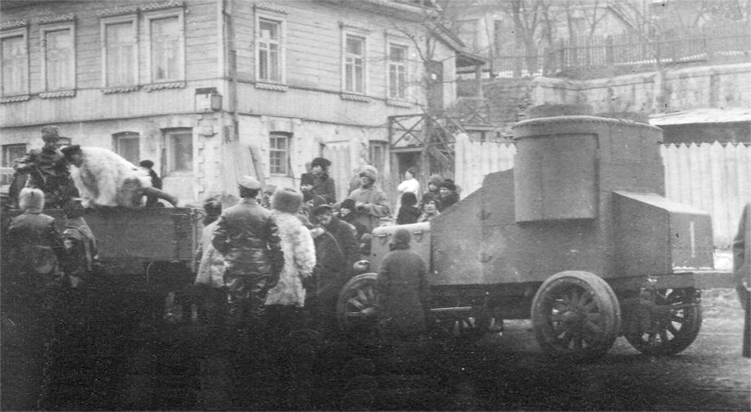 Additionally, this model is often confused with the later AFSR Armstrong-Whitworth-FIAT, which served in numbers in General Wrangel’s “White” Army in 1919-1920. 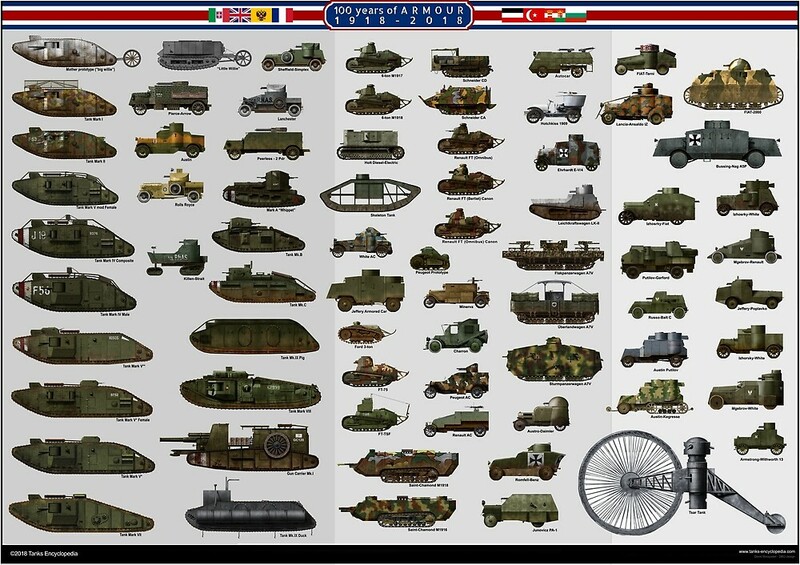 A prototype was ordered as early as 1913, tested in exercises, and a batch of 36 vehicles was received in the fall of 1915. 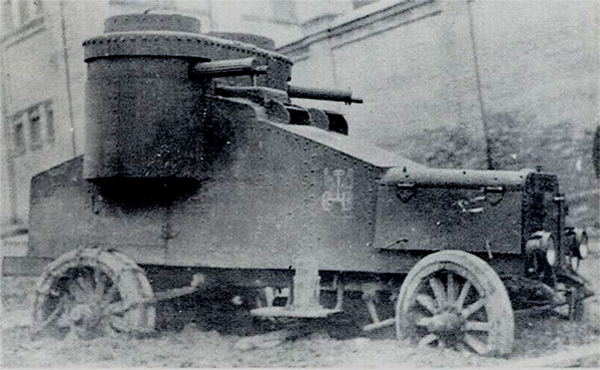 A series of photos, dating back to 1919, show a captured vehicle resembling the Armstrong-Withworth, also adding to the confusion. 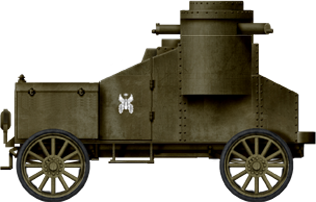 Basically, the Armstrong-Withworth was an armored version of the standard AW 4-cylinder commercial car, the chassis receiving a framework covered by metal plates, of unknown thickness, perhaps 3 to 5 mm (0.12-0.2 in) which were common boilerplates, being the usual iron plate thickness. For extra thickness, boiler plates were used. All were bolted on the frame. The configuration was straightforward, with the driver’s compartment forward, and one access door on each side. 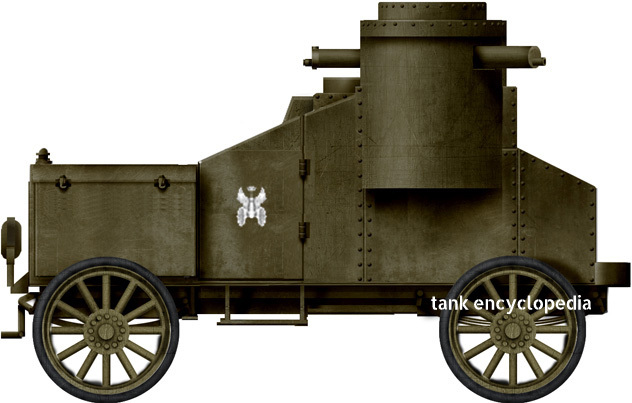 The fighting compartment was just behind, with a single, fully revolving drum turret operated by a standing man. The standard armament was a Vickers 7.9 mm (0.31 in) liquid-cooled machine gun. The suspension used leaf springs, and the wheels were wooden spoked commercial models, which proved problematic on very bad, stumpy roads. It was characterized by an epicyclic pre-selector gearbox, designed by Walter Gordon Wilson, which also collaborated with William Tritton on the famous “Little Willie“. The Armstrong-Withworth model 1913s were received from 1915 to the end of 1916. By that time, many better models were already in service, including the locally built Austin-Putilov, and the former compared miserably according to the crews, as it was plagued by defects. The high center of gravity, the high ground pressure and the performances of the car were abysmal on soft ground. Their fate is unknown since information about them is very conflicting. 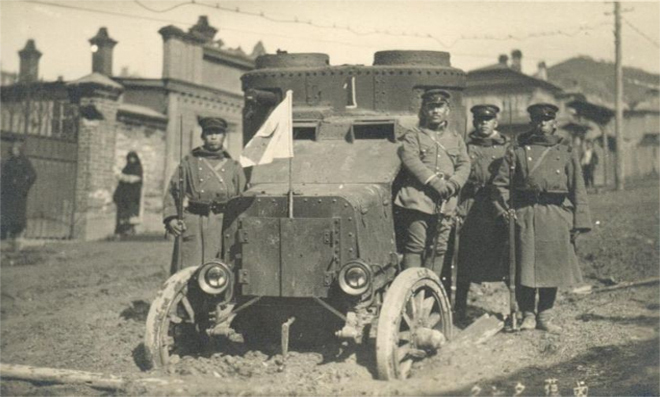 Pictures show a captured Armstrong-Withworth in Manchuria, with Japanese soldiers in Vladivostok in 1919. 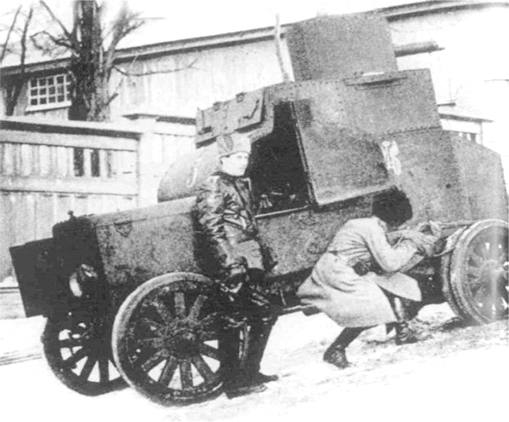 However, after further investigation, these photos show a Russian copy realized in 1915 on a FIAT chassis. 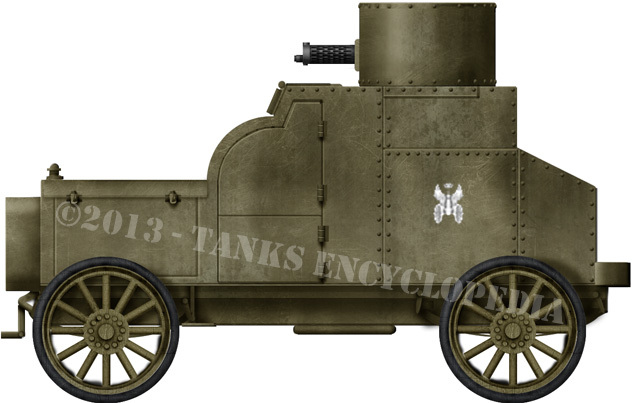 Three were made, the first was a single turret version, the two others sporting two Vickers machine-guns in sponsons. The information available in the table below is unsure. 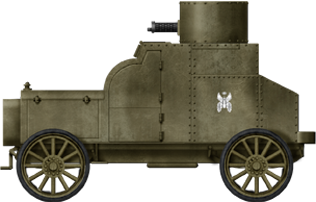 First model, Armstrong-Withworth 1913 with a single turret. 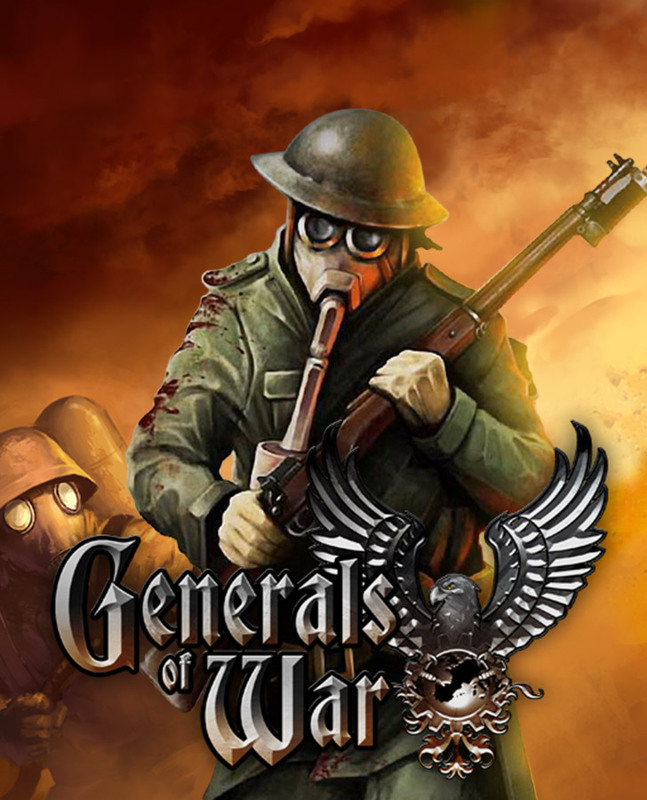 Some sources state that a twin machine-gun version was also part of the deliveries, with both machine-guns in sponsons. But since little photographic evidence exists, it could have also been a 1915 or 1919 copy. 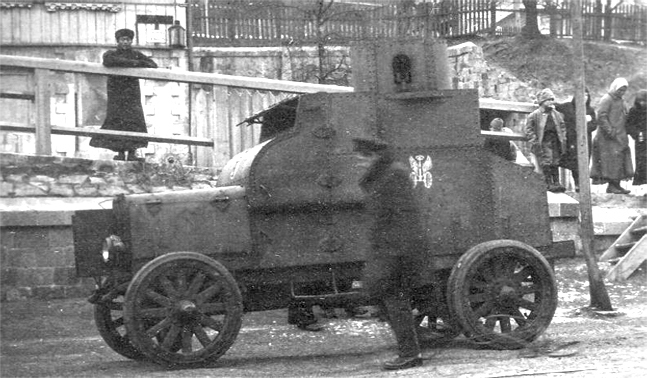 This vehicle was not part of the original batch, but one of three Russian copies built in 1915, probably at Dalzavod works in Vladivostock, on a FIAT chassis.